Portable storage devices have become very popular over the years, especially for people on the go or in charge of maintaining numerous PCs. 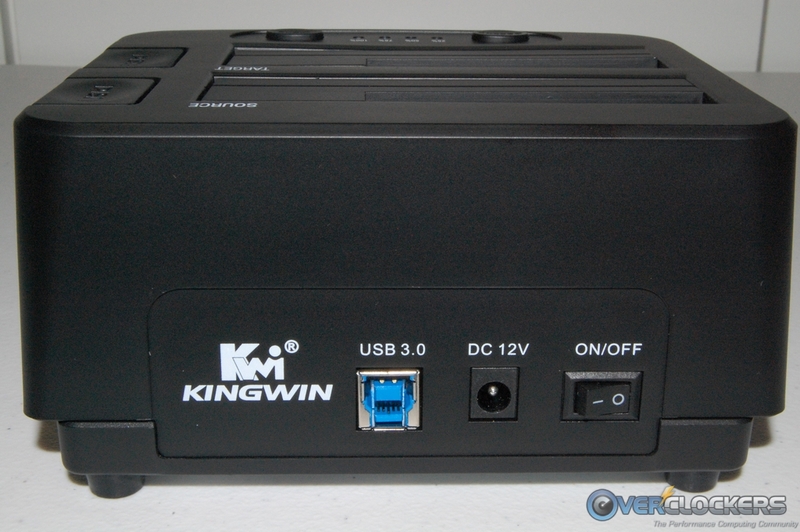 The Kingwin Power Dock Clone Docking Station has the ability to easily add external storage via its USB 3.0 interface and can also clone hard drives without being connected to a PC. These features should make it an enticing option for IT professional and home users alike. Let’s go check this unit out and see what Kingwin’s Power Dock USB 3.0 Clone Docking Station has to offer. Here are the specifications as provided by the Kingwin product page. We can see the Power Dock supports both 3.5″ and 2.5″ SATA HDDs and SSDs up to 4 TB in capacity. The unit is constructed of plastic and aluminum and weighs in at a mere one pound. 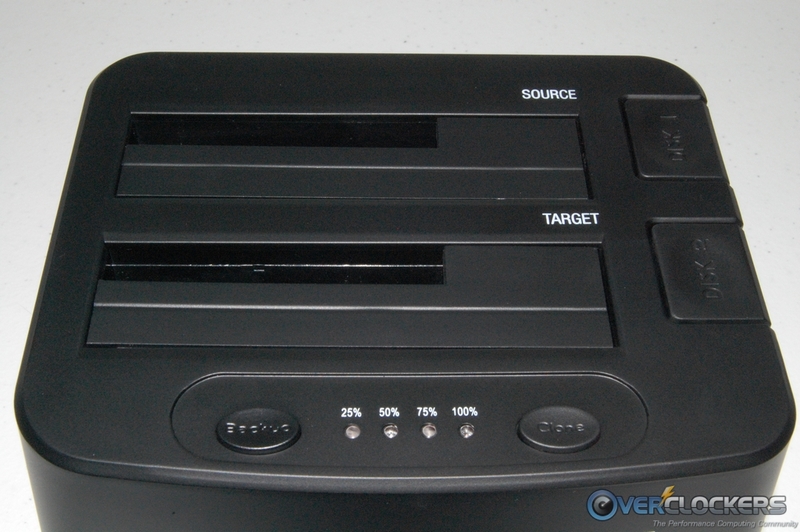 The unit offers one click stand-alone cloning without the need to connect the unit to a PC. The USB 3.0 interface allows for transfer speeds up to 5 Gbps. Here is a list of additional features also provided by Kingwin’s product page. The Kingwin marketing folks have quite a bit to say about their Power Dock Clone Docking station, so let’s give them a chance to give their side of the story! The dual bay fitting on the PD2537U3 power dock complements the USB 3.0 super speed feature by enabling you to run two hard drives at the same time. 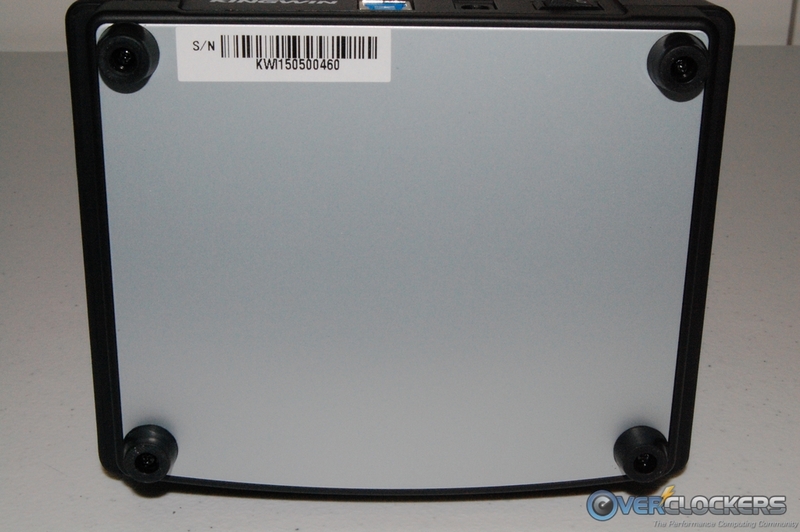 Both docking slots are compatible with 2.5″ and 3.5″ solid state drives and SATA hard drives. The USB 3.0 power cable eliminates the need of powering the power dock up when using 2.5″ hard drives. However, you will need to plug in power when using 3.5″ hard drives. 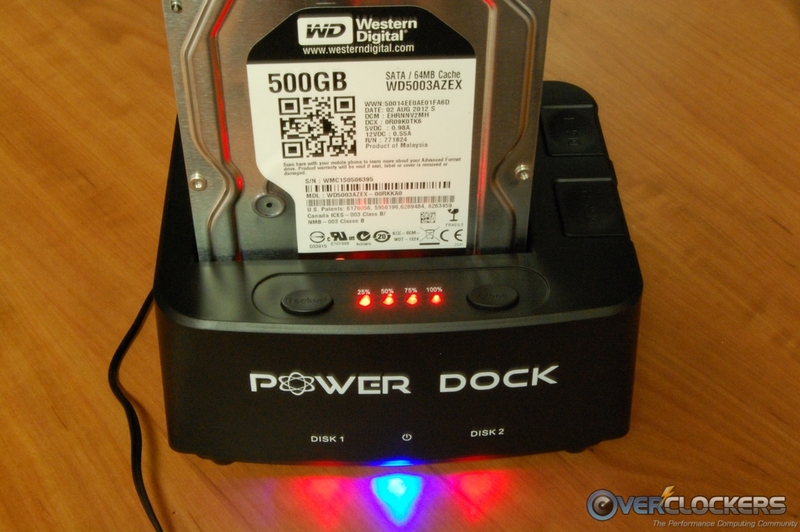 This unique docking station comes with LED indicator which serves as a power gauge and HDD access display. 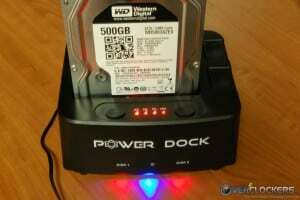 An additional stand-alone drive duplicator means that you can also duplicate your hard drives directly on the PD-2537U3 power dock without connecting to a computer. The device runs on a plug-and-play mode. Requiring no driver installation, this hard drive docking station allows you to access, transfer, duplicate, and store hard drive data through any PC with XP or Windows 8, Mac OS X and Linux operating systems. The retail package does an excellent job of explaining the product within. 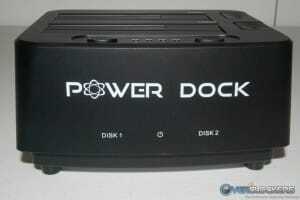 A tour around the box will give you the specifications, features, and a view of the Power Dock from various angles. Once inside the box, you’ll find the contents neatly arranged and well-protected with plastic wrapping and a cardboard insert. Included in the box are the Power Dock Clone Docking Station, product documentation, USB cable, AC power adapter, and a mini-CD with the One Touch Back-Up Utility software. 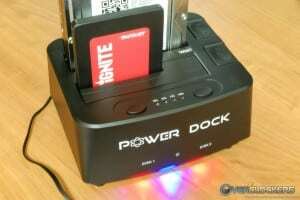 At the top of the Power Dock, you’ll find the dual slots for installing 2.5″ or 3.5″ HDDs, the drive eject buttons, back-up and clone buttons, and cloning status LED indicator lights. The front area has a big Power Dock logo and more lights to indicate when the unit is powered on and which drive bays are populated. At the back are the connections for the USB cable and AC power adapter, along with a power on/off rocker switch. The bottom of the unit has four rubber feet that are roughly 1/4″ tall. The rubber feet will help to keep the unit from sliding around on the surface and provide a bit of vibration dampening as well. The One Touch Back-Up Utility software supports Mac operating systems and Windows XP/Vista/7/8/8.1/10. We installed it on our test system that’s running Windows 8.1 and it worked very well once it’s configured. 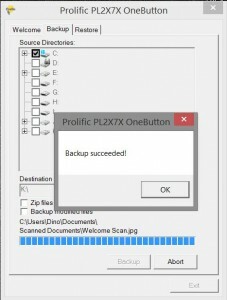 Configuration includes going through the steps of choosing which files and folders to include in the back-up process and where to save them. 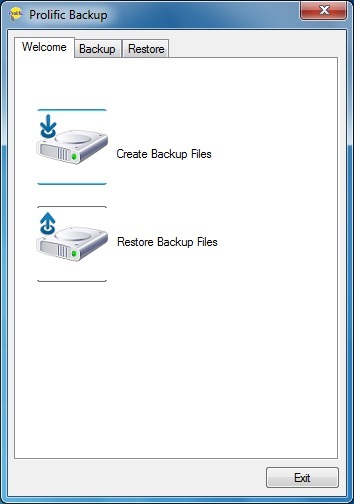 The same configuration process can be performed for the restore function should you ever need that function. 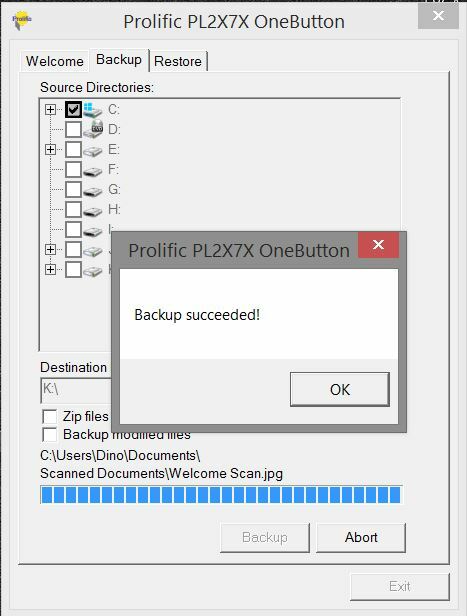 Launching the program will present the window shown below, at which point, you can configure and execute the back-up or restore functions. If you simply press the back-up button on the Power Dock, it will automatically back-up whatever files and folders you previously configured to the location you selected. 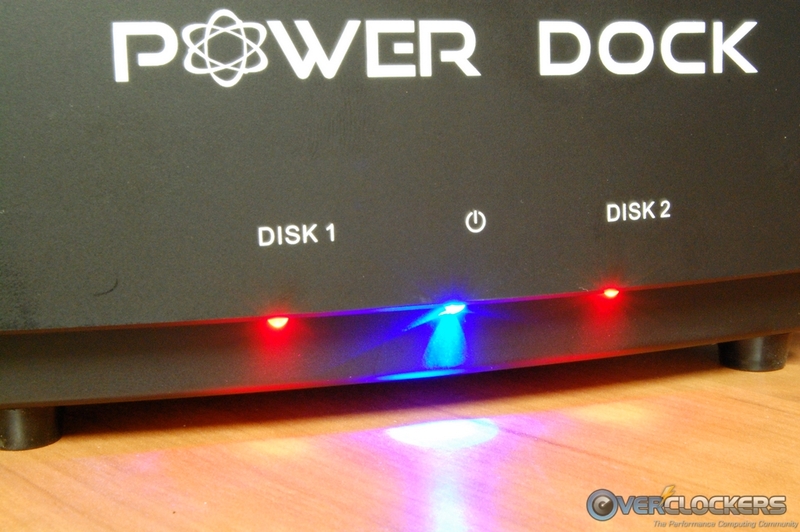 With a couple of drives installed in the Power Dock, you can see the indicator lights telling us the unit is powered on, and a drive is installed in each slot. The lights are tucked under the face of the unit, which results in a nice glow on the work surface. The first thing we wanted to test was the cloning feature. We grabbed another SSD that has a fully loaded operating system with roughly 180 GB of data on it and cloned it to a 3.5″ SATA 6 GB/s platter hard drive. After pressing the clone button, the cloning progress LEDs begin to flash red in a left to right/right to left sequence. As each stage of the cloning process completes (25%, 50%, 75%, 100%), the corresponding LED will stay solid. 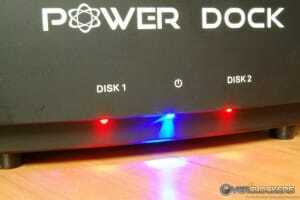 The Disk 1 and Disk 2 LEDs tucked under the front of the unit also flash while the cloning process is doing its thing. You end up with a nice little light show during the cloning process, that’s for sure! Once the cloning process completes, the four status lights will stop flashing and remain solid. The Disk 1 and Disk 2 LEDs will stop flashing at this point as well. At this stage, simply power the unit off, and remove the drives. The amount of time to complete the cloning process will vary depending on the amount of data and type of drives involved, but the entire process took right at 30 minutes on our setup. Using ATTO Disk Bench, we set out to test read/write speeds. First up was a 3.5″ SATA 6 GB/s platter hard drive. In this test, we peaked out at 140 MB/s read and 135 MB/s write. 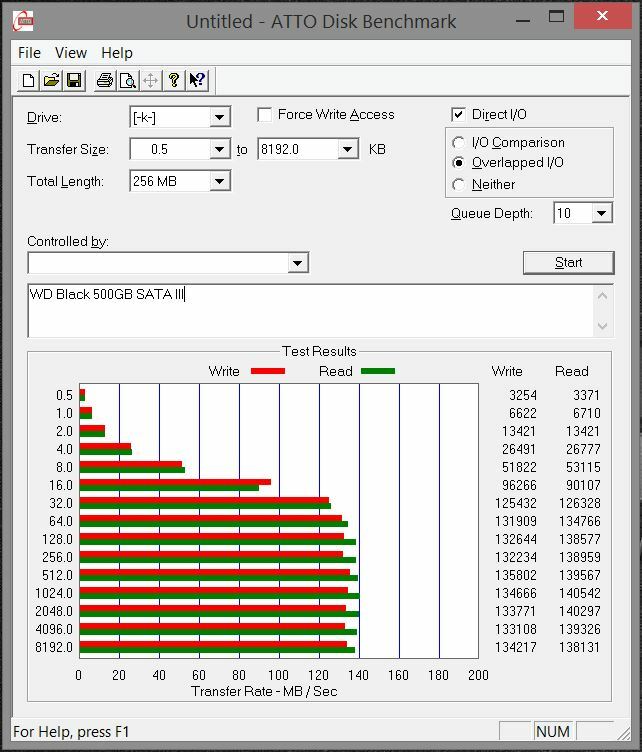 That’s about all you can expect from from the Western Digital Black HDD we used in this test. As expected, once an SSD is installed, read/write performance takes a big jump. With a Samsung 840 Pro SSD installed, we see read/write speeds maxing out at 269 MB/s and 263 MB/s respectively. Great performance from the Kingwin Power Dock here. The Kingwin Power Dock Clone Docking Station is a sweet little device that has a lot of potential uses. 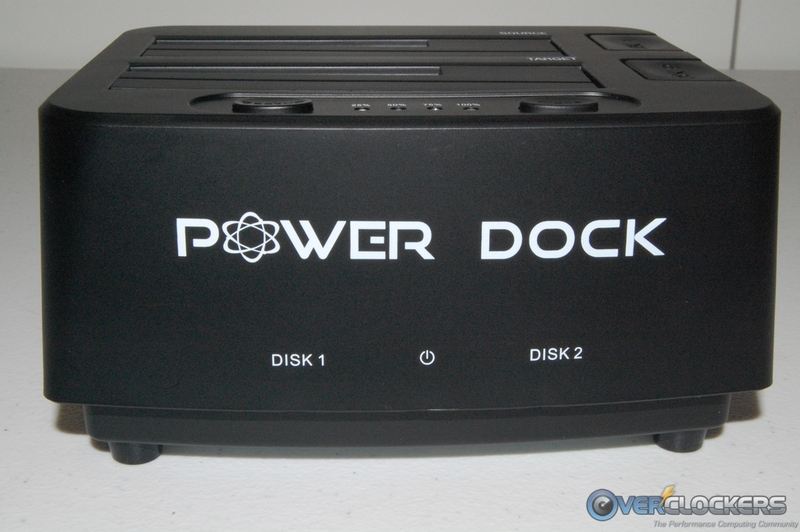 Anything from adding simple external storage to easily performing cloning operations, the Power Dock can handle it all. 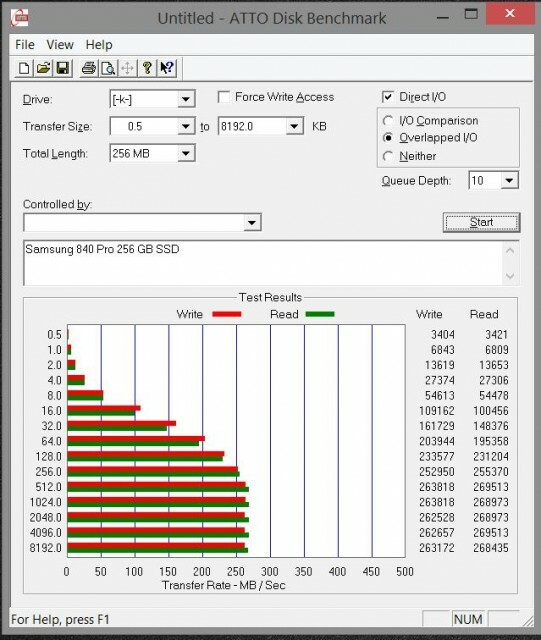 Transfer speeds with the Western Digital Black 3.5″ SATA 6 GB/s platter drive were about as good as expected, but as expected things perk up quite a bit when you use a SSD drive. The cloning function worked perfectly and did so in a very reasonable amount of time. The fact that you don’t have to have the Power Dock hooked to a PC to perform the cloning operation is a major plus and adds to the portability of the unit. As far as pricing goes, it’s currently available at Newegg for $37, which is more than a fair price for everything the Power Dock offers. Given its portability, cloning capabilities, excellent performance, and affordable price, the Kingwin Power Dock Cloning Docking Station is definitely worth a look if you’re in the market. I hope there's software updates planned for this. This guy would be great for cloning my benching drives. You don't need the software for HDD cloning. Sweet Dino. Thanks for the find and testing. I used something similar about 20 years ago, industrial availability only and wondered at the time if a retail version would ever make the market. Excellent. Just an FYI for everyone on this review. It was updated as far as the software goes. Originally I couldn't get the software to install, but as it turns out there must have been a problem with the mini-CD included in the box. I downloaded the software instead, and it installed and worked fine. So, in the end, the software should work with XP through Win 10. Thanks for the review and thanks or the update. I'm happy to see that the disk capacity of these devices seems to be creeping up, though not as fast as the drive themselves. I wonder if the firmware on any of these is ever updated to keep up with drive size. 4tb max is useless to me. I picked up a thermaltake usb3 hdd adapter just for this occasion. 2.5" drives need just the dongle and a usb3 port. 3.5's require the wall plug as well. Basic as hell but will get the job done regardless of the size of the drive. Works with internal writers as well. I just ordered it today.